Learn how to use Prep for taxes to review, adjust, and export your client’s QuickBooks Online accounts for tax season. 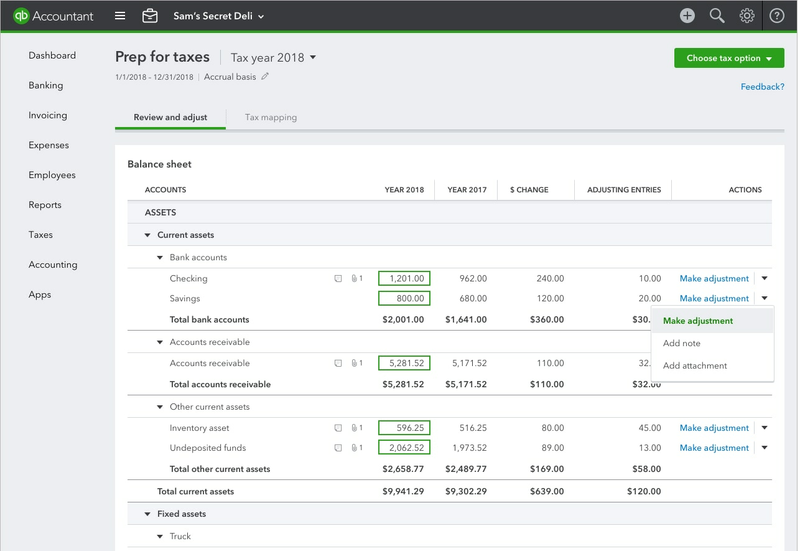 Prep for taxes for QuickBooks Online Accountant lets you review a client’s accounts from a single dashboard. After your review, QuickBooks automatically assigns their accounts to the proper lines on tax forms. You can export the mapped tax forms to ProConnect Tax Online (or as a CSV) and get a headstart on your client’s tax return. Here’s how to use Prep for taxes to get your clients ready for tax season. If you’re in QuickBooks Online Accountant, go to the Clients tab. Find your client and select Prep for taxes from arrow drop-down in the Actions column. 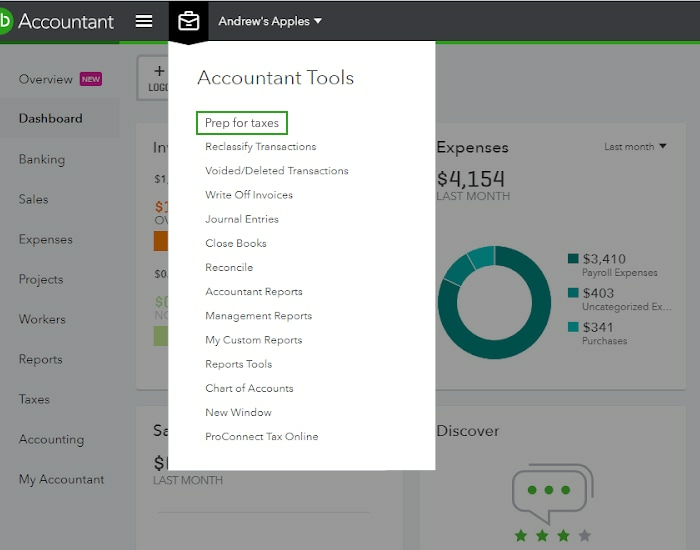 If you’re working in a specific client’s QuickBooks Online account, select Prep for taxes from the Accountant Toolkit. Each client has their own dedicated Prep for taxes page. Start your work in the Review and adjust tab. Your client’s annual Balance Sheet and Profit and Loss Reports sit side-by-side for quick comparisons. You’ll also see last year’s totals, account differences, and any adjusting entries you’ve made in Prep for taxes. Expand the list of accounts. Select the account total from the column for the current year. Prep for taxes has everything you’ll need to make adjusting journal entries. Among many uses, you can use them to adjust transaction totals without changing the original record. You can think of them like amendments. Find the account on the list. Select Make adjustment from the Actions column. You can attach notes and source documents to each account. Select the arrow drop-down from the Actions column. Select Add attachment or Add note. Clickable icons will appear next to each account for easy reference. You can toggle between accounting method views to make your review easier. This won’t affect your client’s settings or view in QuickBooks Online. Select the pencil icon next to the accounting method. Toggle between Cash and Accrual. The Change List at the top of the Review and adjust tab acts as an audit log. Every time someone makes a change in Prep for taxes, it’s logged on this list. For these changes to go through, be sure to select Accept Changes. After reviewing your client’s accounts, you’ll assign them to specific lines on tax forms. Go to the Tax Mapping tab. Select the pencil icon next to the form name. Select the appropriate tax form for your client. Important: Edits don’t carry over to different forms. If you change forms in the middle of mapping accounts, you’ll need to make edits again on the new form. Prep for taxes will automatically assign most accounts to tax lines. Accounts that still need to be assigned appear in the “We found unmapped accounts” section. Simply select Assign tax line and move them to the correct tax line. Find the account on the tax form. Choose the correct tax line. If you started a return in ProConnect Tax Online before starting work in Prep for taxes, select Update existing return. Keep in mind, this will overwrite any existing information you’ve entered into ProConnect. If you finish work in Prep for taxes before starting a return in ProConnect, select Create new return. This creates a fresh return in ProConnect. ProConnect fills in form fields using your mapped tax forms. Check that everything exported correctly and complete your client’s return in ProConnect. The downloadable CSV is formatted for Lacerte tax preparation software. But you can edit the CSV to work for other programs. Select the Choose tax option button.